More than 250,000 people are expected to flock to the Wales Airshow in Swansea across the weekend with the Red Arrows among the highlights. 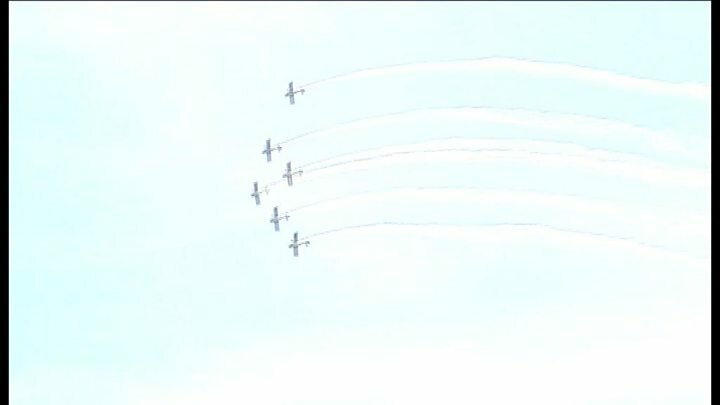 Parachute teams and daredevil wing walkers will also perform during the three-day show which will be bigger than in recent years. The event will impact traffic, with a large section of one of the city's busiest roads shut. Oystermouth Road is closed from 10:00 BST on Friday to 6:00 on Monday. The closure, from by the Civic Centre to Sketty Lane, is expected to impact on people trying to get to Mumbles and Gower to enjoy the warm weather over the next few days but diversions are in place. Image caption Nose dive: This dramatic shot of the Red Arrows display at last year's show was captured by Mark de'Boer Lloyd. The council said the decision to close one of the busiest roads had not been taken lightly. "It is really the only safe option for the many thousands of visitors that weekend," said councillor Mark Thomas. "We closed the road last year during the air show hours and it worked very well. "This year we'll be extending the closure across the weekend to make the event even safer for visitors." The westbound road will temporarily reopen between 15:00 and 19:00 on Friday.